I have been on a little Julia Child kick this winter…I watched the movie Julie & Julia again, I am reading My Life in France and I tried a couple of recipes from Mastering the Art of French Cooking, Vol. 1. 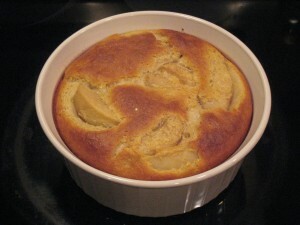 One of those recipes was for a pear clafouti, which we had as our first dessert of the new year. It’s one of the recipes in the book that isn’t heavy with butter or cream, so I actually followed it pretty closely. The woman knew what she was doing, so who am I to fiddle with her recipes too much? 🙂 The only minor substitution I made was skim milk instead of whole. Prepare the pears, and let them soak in the cognac and 1/3 cup sugar for about an hour. Preheat your oven to 350 degrees. Place the baking dish (I used a casserole dish) into the oven to preheat. Place the ingredients from the milk to the flour in a blender along with the remaining cognac and sugar poured out from the pears, and blend at top speed for a minute. Take your baking dish out of the oven when it is hot, and lightly butter the bottom and sides. Pour a 1/4 inch layer of batter into the bottom. Spread the pears over the layer. Then pour the remaining batter on top so the pears are covered. Bake on the middle rack for about an hour, or until it is puffed and browned and a wooden skewer inserted in the middle comes out clean. Serve warm. I hope you enjoy this sweet start to the new year! Bon appétit!